Products Not Selling Fast Enough on Amazon? What's every Amazon seller's #1 goal? Make more money! But let’s face it: you don’t make a dime until your product SELLS. The longer your products sit in Amazon's warehouses, the longer it takes to recoup your investment. Worse, if they sit long enough, you start racking up fees that eat away at your profits. There’s only one way to succeed at FBA: keep that inventory moving! While some people think selling on Amazon is a “set it and forget it” system, seasoned pros know that gobs of traffic and sales don't just happen automatically. Competition on Amazon today is brutal. You need to know how Amazon decides which products to show first when customers search their site as well as how to entice and inspire shoppers to buy. When you understand and use that knowledge to your advantage, you’ve got a serious leg up on your competition. The challenge? There's a lot of information you need to know, and you probably haven’t got time to weed through all the fluff to get to the meat of it. So why struggle? My team and I have been paid to write over 2,000 Amazon product listings, and have seen our customers’ sales transformed as a result. We already know what works and what doesn't. In the Product Description Boot Camp, I’ll let you watch over my shoulder as I walk you through the exact same steps my team and I use when writing sales-boosting product listings for our clients. Nothing will be held back. repeat, and reap more sales on EVERY listing you create on Amazon. For less than you would pay me and my team to create 1 listing for you, you can develop an unlimited number of product listings anytime you want. This is absolutely the fastest and easiest way to master product listing creation! The power is in your hands. How to quickly get shoppers to envision themselves using (and loving!) your products. PLUS – A look at how Amazon Mobile impacts how you create titles, bullets and descriptions and the differences in how they display on mobile devices. Since almost 75% of shoppers buy from Amazon using a mobile device, this is critical to understand. Nothing drives the point home like seeing the steps applied to real-life listings. So, I'll review several actual product listings and critique them each in the sessions. You'll see how to improve under-performing listings and point out exceptional product pages we can all learn from. ideas, discuss the lessons, ask questions and get feedback from the members of our private Facebook group just for Amazon sellers. 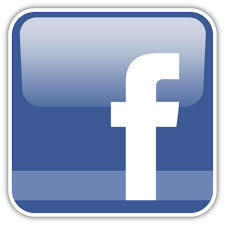 You'll have unlimited access at no additional charge. How much did you spend on that inventory? And how much do you stand to lose if it just sits in Amazon's warehouses? You can easily make back your investment by applying these strategies to just ONE product listing. And the returns don’t stop there. With your new-found skills, you'll keep on cranking out profit-producing titles, bullets, and product descriptions that deliver a steady flow of sales with every new product you add! NOTE: We will stay laser-focused on creating enticing titles, bullets and descriptions that convert; discovering high-volume keywords; and testing/tweaking your listings for maximum results. This training does not include information about images, pricing strategies, reviews or setting up listings in Seller Central. awesome titles, bullets, descriptions & keyword lists? “Thought I would let you know how our sales have gone since your work. I did a little advertising and got 10 sales. I also raised the price 17%. We were selling at a rate of 2 per day before the listing change. When we ran out of stock, we were selling at a rate of almost 12 per day! I would say the changes your staff made were pretty effective, wouldn’t you? Who is this training best suited for? If you are a private-label seller, a wholesaler who brings new products to Amazon, a seller who creates custom bundles or a manufacturer with your own products that you sell on Amazon, this program is perfect for you! This would not be applicable for arbitrage sellers who tack onto existing listings that were created by other sellers. In the Product Description Boot Camp, are we going to learn about images, pricing and reviews? My specialty is persuading using words so this boot camp is laser-focused on finding traffic-driving keywords and developing conversion-oriented titles, bullet points and product descriptions. I bought your “Amazon Advantage: Product Listing Strategies To Boost Your Sales” ebook. Is this program the same as that? It's similar, but I'll dig much deeper during the Product Description Boot Camp than in the ebook, critique actual listings to provide valuable insights and answer questions as we go along. Plus there is information included in the Boot Camp that is not in the ebook. What format is this training in? 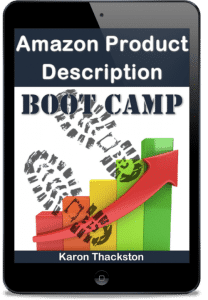 The Amazon Product Description Boot Camp is a video-based training series that was previously recorded live via Zoom. Because the creation of product descriptions for Amazon is a very visual process, I chose this format. That allows you to see exactly what I'm doing, as I'm doing it during the sessions. How long does my access to the Boot Camp videos last? You have a single-user license so you can log into your account and view the videos for the life of the product. If you need access for multiple team members, contact us for deep discounts on additional licenses. Does this program have a monthly fee? You only pay once for a single-user license of the entire training for one person. No monthly fees. If you need additional licenses for VAs or employees, just ask and we'll arrange for a discount on those.